Of the three composers whose music is represented on this disc, all active at the turn of the nineteenth century, the name of only one will, probably, be familiar to the majority of listeners, and even that by proxy: Rodolphe Kreutzer is known to every violin student as the dedicatee of Beethoven’s A major Violin Sonata, Op 47, and the author of the 42 études ou caprices. Reicha’s is a name well-known to music historians but, though prolific, famous and successful as a composer in his day, since his death in 1836 his musical works have been neglected; it is as a theorist that he has been remembered. Crusell is, to some extent, the clarinettist’s Kreutzer, and his concertos and other works for the instrument have now assumed pedagogical value, seldom finding their way into the concert hall. The marriage of solo wind instrument to string trio or quartet has generally been a felicitous one. 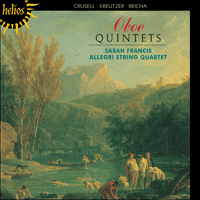 If, by the end of the eighteenth century, the string quartet had evolved into a medium into which a composer could pour his deepest thoughts, the addition of flute, oboe or clarinet generally brought reminders of the old-fashioned serenade or divertimento; music primarily intended to entertain (though the best-known example of the genre, Mozart’s Clarinet Quintet, undoubtedly ranks with his finest music). Crusell’s Oboe Quintet, Op 9, is indeed called a ‘Divertimento’. Born into a family of Finnish bookbinders on 15 October 1775 in Nystad, Bernhard Henrik Crusell’s musical ability was quick to manifest itself, though it was not encouraged by his parents. Nevertheless, he became apprenticed to a military band at the age of thirteen (he had taken up the clarinet at the age of four) at Sveaborg, which transferred to Stockholm in 1791. It was as a clarinettist that Crusell was to make his name, studying with Franz Tausch in Berlin and later with Jean Xavier Lefèvre in Paris. Whilst in Stockholm Crusell studied music theory with Abbé Georg Joseph Vogler (one of the more colourful and controversial of the many theorists working at the end of the eighteenth century), Kapellmeister and tutor to Gustav III since 1786, but it was only at the turn of the century that he himself began composing seriously. As a measure of his success, many of his works were published by Peters in Leipzig; he was the first Finnish composer whose music appeared in print. Vogler, who had been enjoined to found a national music school in Stockholm, must have been pleased. On paper the overall plan of the C major Divertimento is conventional enough, but the structure is in fact entirely novel. As a wind player himself, Crusell treats the oboe very much as a soloist and many of the gestures derive from the concerto and operatic aria. The first Allegro proceeds very much as a normal sonata-form movement would (the very flexible approach to modulation may well have been learned from Vogler), but the spirited codetta, which gives the oboist the opportunity to show off some high notes, leads not into the expected development section but into a cadenza for the oboe which in turns leads directly into the slow movement. (This practice of truncating the first movement found some favour in the nineteenth century, the best known example being Max Bruch’s G minor Violin Concerto.) The C minor Andante poco adagio is a movement whose gravity is tempered by some smiling turns towards the major mode. Towards its close the mood becomes more fervent, but this is dispelled by the ensuing Allegro, which again follows without a break and is itself little more than a fairly extended introduction to the Allegro vivace finale proper. Rodolph Kreutzer was born in Versailles in 1766 and became one of the most famous and influential violinists of his day. Like most contemporary musicians he was equally active as a composer, producing no fewer than nineteen violin concertos as well as a good deal of music for the stage – ballets, operas and opéras-comiques. Most of his chamber music dates from the 1790s. The exact date of the Oboe Quintet – the solo wind part may also be taken by the clarinet – is not known, but the work is presumed to have been written between 1790 and 1799. It is a relatively short piece, despite being labelled ‘Grand Quintet’. As in the Crusell there is a surprise in the first movement: in place of the development is an Andantino section, prefaced by a hymn-like passage for the strings. The slow movement itself, in F major, is long-lined, very vocal in style, with a recurring dotted rhythm (redolent of the first movement of Beethoven’s ‘Moonlight’ Sonata) and an affecting use of the Neapolitan. The music’s vocal quality is furthered by a recitative section, an operatic dialogue between oboe and first violin, before the short finale, a perky Presto non troppo. Compared with these, Antoine Reicha’s F major Quintet is conventional, though his craftsmanship is not to be gainsaid. Antoine Reicha (as he became; he was born Antonín, or Anton, Rejcha in Prague on 26 February 1770) was one of the leading pedagogues of the late-eighteenth and early-nineteenth centuries. Among his more illustrious pupils were Berlioz, Liszt, and, briefly in the last year of his life, César Franck. In his youth he knew Beethoven and C G Neefe (his adoptive family moved to Bonn in 1785 where Anton played flute and violin in the Hofkapelle) and also Haydn. After a few unsuccessful years in Paris, 1801 found him in Vienna where he took lessons from Albrechtsberger (from whom, like Beethoven, he probably gained his mastery of contrapuntal techniques) and Salieri. In 1808 he returned to Paris, dreaming of operatic success. Though this was not forthcoming, as a composer of chamber music his fame continued to grow: he produced no fewer than four sets of wind quintets. Such was his reputation that he was appointed professor of counterpoint and fugue at the Conservatoire in 1818 and it was around this time that his Cours de composition musicale was published. The famous Traité de haute composition musicale, his most important treatise, followed between 1824 and 1826. This work provoked much controversy and within a few years had been translated into English, Italian and Spanish. Des trois compositeurs dont la musique est présentée sur ce disque – et qui, tous, furent actifs au tournant du XIXe siècle –, seul un, probablement, sera familier à la majorité des auditeurs, et encore, par procuration: Rodolphe Kreutzer est connu de tout étudiant en violon pour être et le dédicataire de la Sonate pour violon en la majeur, Op 47 de Beethoven, et l’auteur des 42 études ou caprices. Le nom de Reicha est bien connu des historiens de la musique mais, bien que l’homme fût, en son temps, un compositeur prolifique, célèbre, et à succès, ses œuvres musicales ont été négligées depuis sa mort (1836), et c’est du théoricien dont on se souvient. Quant à Crusell, il est, dans une certaine mesure, le Kreutzer des clarinettistes, et ses concertos et autres pièces pour clarinette, qui ont désormais valeur pédagogique, atteignent rarement les salles de concert. Le mariage d’un instrument à vent soliste au trio ou au quatuor à cordes a habituellement été heureux. Si, à la fin du XVIIIe siècle, le quatuor à cordes était devenu un moyen d’expression dans lequel le compositeur pouvait déverser ses pensées les plus profondes, l’ajout d’une flûte, d’un hautbois ou d’une clarinette fut généralement vecteur de réminiscences des surannés sérénade ou divertimento: la musique visait essentiellement au divertissement (même si le plus fameux exemple du genre, le Quintette avec clarinette de Mozart, figure indubitablement au rang des plus belles pages du compositeur). Le Quintette avec hautbois, Op 9 de Crusell est, d’ailleurs, appelé «Divertimento». Né dans une famille de relieurs finlandais, le 15 octobre 1775, à Nystad, Bernhard Henrik Crusell manifesta des dons musicaux précoces, en dépit de l’absence de soutien de ses parents. Il entra malgré tout comme apprenti dans une fanfare militaire, à l’âge de treize ans (il avait commencé la clarinette à quatre ans), à Sveaborg, avant d’être transféré à Stockholm en 1791. Ce fut en tant que clarinettiste qu’il devait se faire un nom, étudiant avec Franz Tausch, à Berlin, puis avec Jean Xavier Lefèvre, à Paris. À Stockholm, Crusell étudia la théorie musicale auprès de l’abbé Georg Joseph Vogler (l’un des théoriciens les plus hauts en couleurs et controversés de la fin du XVIIIe siècle), Kapellmeister et précepteur de Gustav III depuis 1786, mais ce fut seulement au tournant du siècle qu’il se mit à composer sérieusement. Preuve de son succès, quantité de ses œuvres furent publiées par Peters, à Leipzig – il fut le premier compositeur finlandais dont la musique fut imprimée. Vogler, qui avait reçu l’ordre de fonder une école de musique nationale à Stockholm, dut en être ravi. Sur le papier, le schéma global du Divertimento en ut majeur est assez conventionnel, mais sa structure est, en fait, totalement neuve. Lui-même joueur d’instrument à vent, Crusell traite le hautbois presque en soliste, et nombre des gestes dérivent du concerto et de l’aria d’opéra. Le premier Allegro se déroule comme un mouvement normal de forme sonate (l’approche très flexible de la modulation est peut-être un enseignement de Vogler), mais la codetta animée – occasion, pour le soliste, de faire la démonstration de quelques notes aiguës – conduit non à la section de développement attendue, mais à une cadence pour le hautbois qui mène, à son tour, directement au mouvement lent. (Cette pratique de troncage du premier mouvement trouva grâce au XIXe siècle, l’exemple le plus connu étant le Concerto pour violon en sol mineur de Max Bruch.) L’Andante poco adagio en ut mineur est un mouvement dont la gravité est tempérée par quelques souriants revirements vers le mode majeur. Vers la fin de ce mouvement, l’atmosphère se fait plus fervente, mais cette ferveur est chassée par l‘Allegro suivant qui, de nouveau, survient directement et n’est guère plus qu’une introduction, assez prolongée, au finale Allegro vivace proprement dit. Né à Versailles en 1766, Rodolphe Kreutzer devint l’un des violonistes les plus célèbres et influents de son temps. À l’instar de la plupart de ses contemporains, il se montra aussi actif dans la composition, produisant pas moins de dix-neuf concertos pour violon et quantité de musiques de scène – ballets, opéras et opéras-comiques. La majorité de ses pièces de chambre remontent aux années 1790. La date exacte du Quintette avec hautbois – la partie de vent solo a pu être tenue par une clarinette – est inconnue, mais l’on présume qu’il fut écrit entre 1790 et 1799. Il s’agit d’une pièce relativement brève, nonobstant son appellation de «Grand Quintette». Comme chez Crusell, le premier mouvement recèle une surprise: le développement est remplacé par une section Andantino, préfacée par un passage hymnique dévolu aux cordes. Le mouvement lent en tant que tel, en fa majeur, est longiligne, de style très vocal, avec un rythme pointé récurrent (évocateur du premier mouvement de la Sonate «Clair de lune» de Beethoven) et un touchant usage de la sixte napolitaine. La vocalité de la musique est servie par une section de récitatif, un dialogue opératique entre le hautbois et le premier violon, avant le court finale, un vif Presto non troppo. Von den drei Komponisten, deren Musik auf der vorliegenden CD vertreten ist und die alle an der Wende vom achtzehnten zum neunzehntem Jahrhundert tätig waren, werden die meisten Hörer – wahrscheinlich – nur einen kennen, und selbst den nur indirekt: Rodolphe Kreutzer ist jedem Violinschüler als Adressat der Widmung von Beethovens Violinsonate Op 47 in A-Dur und Verfasser der 42 études ou caprices bekannt. Reicha ist ein Name, mit den Musikhistoriker vertraut sind, doch sind die Werke dieses zu Lebzeiten fruchtbaren, berühmten und erfolgreichen Komponisten seit seinem Tod 1836 in Vergessenheit geraten, und er ist nur als Theoretiker in Erinnerung geblieben. Crusell ist gewissermaßen der Kreutzer der Klarinettisten: Seine Konzerte und anderen Werke für das Instrument werden für pädagogische Zwecke genutzt, ohne je den Weg in den Konzertsaal zu finden. Die Verbindung zwischen solistischem Blasinstrument und Streichtrio oder –quartett ist im allgemeinen eine glückliche. Zwar hatte sich gegen Ende des achtzehnten Jahrhunderts das Streichquartett zu einem Medium gewandelt, in das der Komponist seine tiefsten Gedanken einbringen konnte, wenn jedoch Flöte, Oboe oder Klarinette hinzukamen, rief dies in der Regel Erinnerungen an die altmodische Serenade oder das Divertimento wach: an Musik, die vorwiegend dazu gedacht war, zu unterhalten (auch wenn das bekannteste Beispiel der Gattung, Mozarts Klarinettenquintett, zweifellos zu seinen schönsten Musikstücken zählt). Crusells Oboenquintett Op 9 trägt sogar die offizielle Bezeichnung ‘Divertimento’. Nachdem er am 15. Oktober 1775 in eine finnische Buchbinderfamilie hineingeboren worden war, wurde Bernhard Henrik Crusells musikalische Begabung recht bald offenbar, obwohl sie von seinen Eltern nicht gefördert wurde. Dennoch trat er mit dreizehn Jahren (er hatte mit vier Jahren begonnen, Klarinette zu spielen) in Svaeborg eine Lehrstelle bei einer Militärkapelle an, die 1791 nach Stockholm verlegt wrude. Und als Klarinettist, der von Franz Tausch in Berlin und später von Jean Xavier Lefèvre in Paris ausgebildet wurde, sollte sich Crusell einen Namen machen. Während er in Stockholm war, studierte Crusell Musiktheorie bei Abbé Georg Joseph Vogler (einem der eigenwilligeren und umstritteneren unter den Theoretikern, die am Ende des achtzehnten Jahrhunderts tätig waren), der seit 1786 Kapellmeister und Musiklehrer Gustavs III. war. Allerdings fing Crusell selbst erst um die Wende des Jahrhunderts ernsthaft zu komponieren an. Es ist ein Maßstab seines Erfolges, daß viele seiner Werke von Peters in Leipzig herausgegeben wurden; er war der erste finnische Komponist, dessen Musik im Druck erschien. Vogler, dem es auferlegt war, in Stockholm eine nationale Schule der Musik zu gründen, muß hocherfreut gewesen sein. Auf dem Papier ist der Grundplan des Divertimento in C-Dur recht konventionell, doch tatsächlich ist seine Struktur völlig neuartig. Da er selbst Holzbläser war, behandelt Crusell die Oboe im wesentlichen als Soloinstrument, und viele ihrer Gesten gehen auf das Konzert und die Opernarie zurück. Das erste Allegro schreitet als ganz normaler Sonatensatz voran (den äußerst flexiblen Umgang mit Modulationen könnte Crusell von Vogler gelernt haben), doch die beschwingte Codetta, die dem Oboisten Gelegenheit gibt, einige sehr hohe Noten vorzuführen, geht nicht in die erwartete Durchführung über, sondern in eine Kadenz für die Oboe, die wiederum direkt in den langsamen Satz mündet. (Diese Praxis, den ersten Satz abzukürzen, fand im neunzehnten Jahrhundert einigen Anklang; das bekannteste Beispiel ist Max Bruchs Violinkonzert in g-Moll.) Das Andante poco adagio in c-Moll ist ein Satz, dessen Ernst durch einige freundliche Wendungen in die Durtonart gemildert wird. Gegen Ende wird die Stimmung hitziger, ehe sie vom folgenden Allegro verdrängt wird, das wieder ohne Unterbrechung anschließt und selbst wenig mehr als eine recht ausführliche Einführung zum Allegro vivace überschriebenen eigentlichen Finale ist. Rodolphe Kreutzer wurde 1766 in Versailles geboren und brachte es zu einem der bekanntesten und einflußreichsten Violinisten seiner Zeit. Wie die meisten Musiker der damaligen Zeit war er als Komponist ebenso aktiv und brachte nicht weniger als neunzehn Violinkonzerte sowie eine große Menge Musik für die Bühne hervor – Ballette, Opern und Opéras-comiques. Seine Kammermusik entstammt mehrheitlich den 1790er Jahren. Das genaue Entstehungsdatum des Oboenquintetts – die solistische Bläserstimme kann auch von der Klarinette gespielt werden – ist nicht bekannt, aber man geht davon aus, daß es zwischen 1790 und 1799 komponiert wurde. Es ist ein relativ kurzes Stück, obwohl es als ‘großes Quintett’ bezeichnet wird. Wie bei Crusell gibt es im ersten Satz eine Überraschung: Die Stelle der Durchführung nimmt ein Andantino ein, dem eine hymnische Streicherpassage vorausgeht. Der eigentliche langsame Satz in F-Dur ist von langen Linien gekennzeichnet und vom Stil her sehr sanglich, mit einem wiederkehrenden punktierten Rhythmus (der stark an den ersten Satz von Beethovens ‘Mondscheinsonate’ erinnert) und ergreifenden neapolitanischen Sexten. Der sangliche Charakter der Musik wird noch durch eine Rezitativpassage erhöht, einen opernhaften Dialog zwischen Oboe und erster Geige, ehe das kurze Finale einsetzt, ein lebhaftes Presto non troppo.